“Yeah,” you say, realizing that your mom is probably picturing you hunched over a vintage typewriter in a New England cabin, decked out in beatnik attire, while tapping out your great American novel and trying to figure out how you’re going to pay off those pesky student loans. Not that you can blame Mom. After all, the term “content marketing” didn’t even exist 10 to 15 years ago. Unfortunately, many of us get this same reaction from folks in our own department. When our colleagues do (sort of) know what we do, they treat us like we’re just off creating “cute” videos and blog posts that just keep people entertained until they can come in and do the real work, or they fail to see our contributions because they’re nested inside much larger campaigns. It can be difficult to pinpoint exactly how our ebook or whitepaper contributed to the stew. 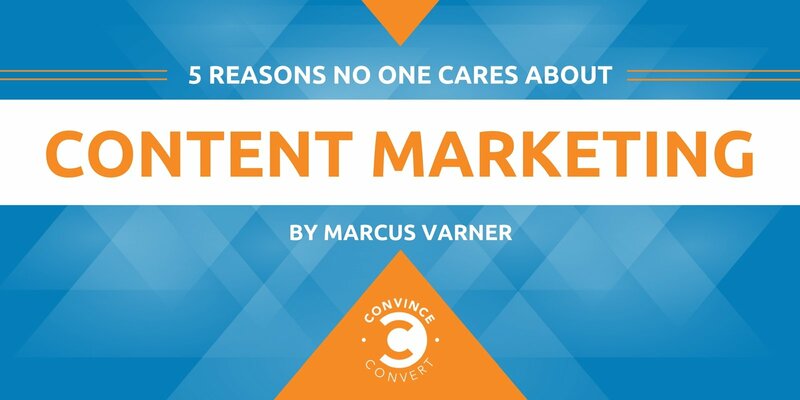 If content is at the heart of all great marketing (and I believe it is), then why do so few people inside and outside of marketing understand what content marketing is and how it creates value? You and I know that our work permeates everything the department does, influencing and converting prospects in subtle but powerful ways. So why is it so hard for others to see that? 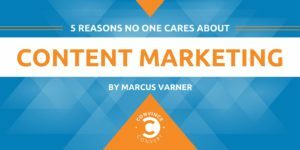 Here are five reasons content marketers are underappreciated, plus solutions for getting those who matter to see the value in what we do. The same goes for design and video. People assume that just because they can throw together a bunch of clipart in PowerPoint or get 150 likes on a video they shot on their iPhone of their daughter making her first soccer goal, our design or video work must be just as easy—more play than work, in fact. The Solution: Accept that some of your colleagues will naturally appreciate the difference between writing for a personal blog and crafting truly useful content that fits the brand voice. Others won’t. You can blame it on the internet and social media being the great equalizers, giving every individual a platform, a voice, and a bit of overconfidence. Unless the skeptics happen to be in a position of authority over you, just embrace your inner Disney princess and “Let It Go.” Your focus should be on making sure you have the support you need from above. You can do this by building a relationship of trust with your superiors, perhaps pointing to statistics that show just how big Fast Company’s reach is, and making your work processes more transparent. Even while we’re at the office, clacking away at the keyboard, composing the best blog post customers have seen in years, it outwardly looks no different than someone responding to an email or updating social media. Like synchronized swimmers, the effortless grace that is seen by spectators above the water masks the frantic effort that’s taking place beneath the surface. The Solution: You could do a better acting job. Grunt more. Sweat more. Make sure you look disheveled and stressed out by the end of the day. Or you could map out your workflows in detail and publish them for all to see, perhaps using work management software. Once your colleagues recognize just how many text and design drafts it takes to get to one finalized and approved whitepaper, not to mention the resources involved, they’ll be less likely to take you for granted. Just because you can publish everywhere doesn’t mean you should. And different individuals within the team can have vastly different opinions about what types of content will work with the audience—not to mention how much of that content should be produced on a monthly or quarterly basis. The Solution: To avoid arguing about subjective opinions on what is and isn’t valuable or relevant, tie all content back to the company’s strategic drivers. Understand the metrics that are being used to evaluate your output—is it about how many assets you release, how many pageviews or downloads each asset attracts, how many different platforms you’re publishing on, how many new prospects are drawn in, or some combination of the above? In the end, if your boss admits that he’s most interested in releasing more content this quarter than last quarter, then that’s the metric you should be paying closest attention to. If he values “more, more, more,” then by all means adopt the content factory approach to get the appreciation you’re looking for. If you can, however, take a stand against time-consuming content that has little strategic value. Pull out your documented work processes to show how many resources are involved in creating this asset, especially if it isn’t being appropriately leveraged down the line. Get those who create the content and those who release and distribute the content on the same page about how much room there really is in the pipeline. If you scale back the number of pieces you produce, you can focus on amping up their individual impact. I recently read a comment on LinkedIn that implied that, because webinars bring in more leads per dollar spent than ebooks, that marketers should ditch ebooks and just invest in webinars. I fired back that people probably wouldn’t give the webinar the time of day if they hadn’t first had experiences with the brand via social, blog posts, and ebooks. We all recognize this kind of overly reductive thinking for what it is, but it does expose how marketing’s metrics obsession is making it very hard for us to gauge and advertise the value of our content. Some of this is our fault. We can do a better job of translating our results into language our bosses care about. The Solution: Words and pictures (whether still or moving) are the native language of most content marketers, while other marketers and business professionals are all about metrics. Spend some time getting fluent in the language of business. Comprehensive work management solutions can facilitate your efforts by tying budgets directly to tasks, improving resource management and allocation, and making forecasting and reporting easier than ever. Imagine being able to prove with data that you completed 10 percent more projects this quarter than last quarter, 95 percent of which were on time and under budget, and that you improved resource allocation, too. That will earn you some appreciation from the number crunchers, but you’ll have to step out of your comfort zone in another way, too. Content marketers have got to get better at touting their work and being their own cheerleaders. The Solution: You are a master at speaking to different audiences; don’t forget that your C-suite is an audience, too. “Rockstar content teams are contextual masters,” says Lucas. “They’re good at building bridges, both internally and externally. They develop resonant concepts and narrative structures to convey memorable marketing messages to prospects and customers. They create vehicles to create market momentum. They show buyers—and brands—the way forward.” They (we) can show executives the way forward, too. This post is part of a paid sponsorship between Workfront and Convince & Convert. Marcus is a content strategist and producer who loves helping brands craft content that improves customers' lives, builds brand credibility, and demands to be shared. For the last 10 years, Marcus has worked in every type of content—from writing to video production to design—and is currently a senior content marketing manager at Workfront, where he oversees all corporate- and awareness-level content. When he's not producing content, he's ravenously consuming it, in the form of books, movies, and podcasts.